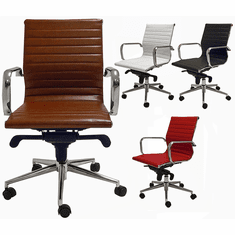 Unlike other fixed height guest chairs, our Contemporary Leather Swivel Guest Chairs offer both adjustability and comfort to your clients. Swivel base and pneumatic height adjustment allows users to choose their own preferred height setting. Chair sits upon floor glides instead of casters, which firmly grip all floors, to keep your chairs from rolling away. IN STOCK in 4 attractive leather colors! 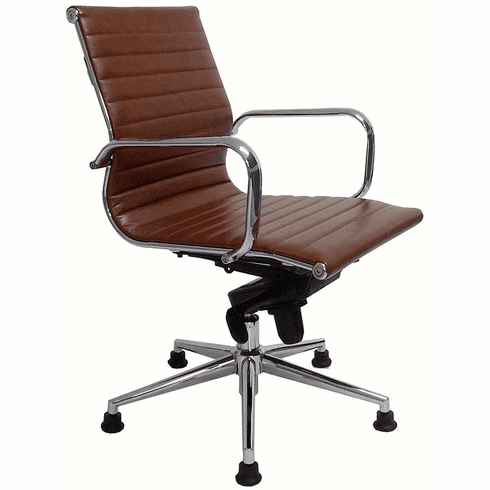 Contemporary Leather Swivel Guest Chair on Glides ships unassembled, but minimal assembly is involved with just four screws! 5 Year Limited Warranty. Shpg. wt. 40 lbs. PRICE INCLUDES SHIPPING! * Unlike stationary guest chairs, this chair allows users to swivel and set their own preferred seat height. * Durable bonded leather upholstery features horizontal stitching. Choose from 4 colors! * No more bulky, puffy office chairs! Sleek, slimline appearance fits in well with modern office décor. 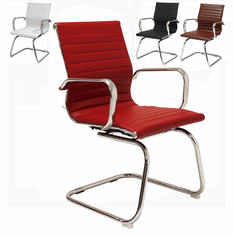 * Leather upholstery is pulled taut over the chrome frame, giving your guests a firm, supportive sit. * Chair measures 22"W x 20-3/4"D x 35-1/2"-38-1/2"H overall. * Seat measures 18-1/2"W x 17-3/4"D.
* Backrest measures 18-1/2"W x 18-1/2"H.